Ice skating & sledding gets the family outdoors. 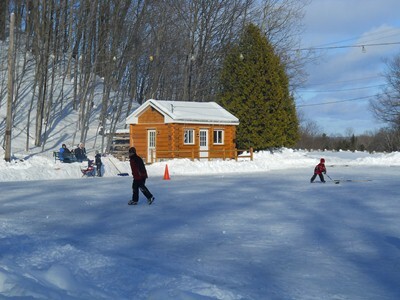 Rinks and sledding hills in Boyne City, Charlevoix, Harbor Springs, and Petoskey are open from Christmas break until the snow melts. Skiing and snowboarding is fun for kids of all ages. Our three top-notch ski resorts---Boyne Mountain, Boyne Highlands, and Nub's Nob--offer free beginner hills and ski schools. Raven Hill Discovery Center is a science and discovery center with great children's activities, hands on displays, and learning opportunities. Crooked Tree Arts Center has a gallery, theatre, gift shop, and a host of children's classes and programs. Libraries Up North have children's books, movies, and activities. What else to do Up North? Movie theatres, bowling, walks on the frozen beach, hiking, snow shoeing, cross country skiing, and more! Outdoors or indoors, day or night, there are Activities Galore!